Americas Lightpaths Express and Protect (AmLight ExP) enables research and education amongst the people of the Americas through the operation of production infrastructure for communication and collaboration between the U.S. and Western Hemisphere science and engineering research and education communities. The success of previous U.S. – Latin American networking has led to a ground swell of change for research instruments. Data intensive instruments and data dependent instruments are being located in South America. The Large Synoptic Survey Telescope (LSST) is a significant example of a data dependent instrument. The decision to locate the instrument in Chile was enabled by the promise of collaborative network infrastructure. LSST has from the beginning been part of the planning for AmLight ExP. Because of bandwidth and growth requirements for LSST the consortium needed to break away from the model of leasing telecom capacity, and gain access to unlit spectrum to be able to drive the technology, not be dictated to by carriers. This vision resulted in the IRNC ProNet: AmLight OPENWAVE supplement that allowed AmLight to experiment with the installation of a 100G alien wave on a submarine system, end-to-end under our control. With significant investment from LSST, ANSP, and RNP, AmLight will have at least 600ghz of optical spectrum by 2018 to provision and operate to meet the needs of the community. This proposed AmLight ExP NSF support (award # 1451018 ) will allow the transition to this new enabling long-term infrastructure. The effort is fundamentally collaborative, encompassing for 2014-2019 the proposed NSF AmLight ExP support ($5.4M) and committed financial resources of AURA ($10M), ANSP ($18.5M), and RNP ($17.2M), the resources of FIU and FLR, AtlanticWave and PacificWave, and the networks of ANSP, CUDI, RedCLARA, REUNA, and RNP. Through AtlanticWave and PacificWave there is production connectivity and peering to North American backbone networks Internet2, ESnet, and CANARIE. Through RedCLARA, there is production connectivity to eighteen national research and education networks (NRENs). These networks will enhance global e-Science collaborations through distributed production peering fabrics, as well as any research and education networks present or future that come to the AtlanticWave or PacificWave. NSF support for AmLight ExP is part of an evolving rational architecture (IREN), designed to support the needs of U.S.-Western Hemisphere research and education community that supports the evolving nature of discovery and scholarship. 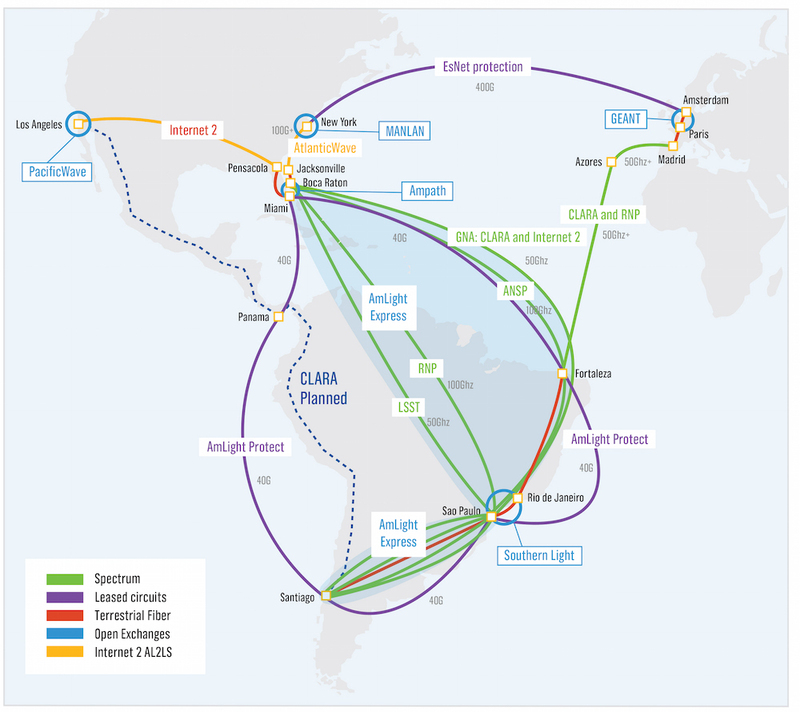 Four different links requiring partial NSF funding between the U.S and South and Central America are proposed: (1) from AMPATH RXP in Miami to the SouthernLight in Sao Paulo (20Gb/s), (2) from SouthernLight to Santiago, Chile (10Gb/s), from Santiago Chile to Miami (10Gb/s), and from Miami to Panama (1Gb/s). The capacity and designs are based on collaborative funding over the five-year project span and will evolve to match the needs of the community as illustrated below. Focus is on ensuring reliability with a blend of carrier provided systems that we protect, and robust high-bandwidth connectivity that AmLight ExP operates and controls. The carrier systems will be provided as Ethernet, and we will light our own sections of dark fiber for the high bandwidth solutions. In Figure 1, the carrier solutions are labeled AmLight Protect and the high-bandwidth is AmLight Express. OpenWave is a critical stepping-stone, allowing AmLight ExP to begin operations with a similar infrastructure evolving to the Protect and Express environment. The focus of AmLight ExP is to be an open instrument for collaboration, interconnecting open exchange points, and providing a means to leverage collaborative purchasing and network operation in order to effectively maximize the benefits to all investors, and manage the NSF investment in the context of international partnerships. AmLight ExP will build upon the results of the WHREN-LILA project, Award# OCI-0441095, and the AmLight IRNC project, Award# ACI-0963053. Over the last 10 years these projects successfully supported a cooperative and collaborate consortium among R&E network providers and users in the Western Hemisphere. 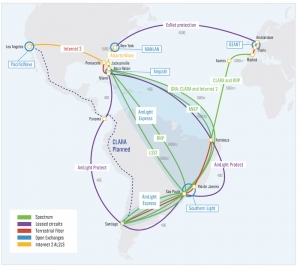 As a result of this work, a new era in Western Hemisphere collaboration began, which WHREN initiated with five 45Mb/s connections between the U.S. and four countries in Latin America. Now, this successful collaboration has capacity greater than 40Gb/s, with connectivity to every country in South and Central America, and one-third of the Caribbean. Julio Ibarra, FIU, PI, Assistant VP Technology Augmented Research at FIU. Has 30+ years of IT and Telecom infrastructure management, 14 of those years of specialization with Research and Education networks and project management. He is the PI of the NSF IRNC AmLight project. Ibarra will provide overall leadership and planning for the project team, and chair the Project Coordination Committee. Ibarra is a member of the Division of IT leadership team at FIU. Heidi (Alvarez) Morgan, Co-PI, is the Research Coordinator and works with the applications communities to ensure effective utilization of the network resources. Responsibilities include working with science groups to document their utilization of the network, and forecast future demand. She will coordinate application specific key personnel. As the current Co-PI of AmLight, she brings extensive experience working with diverse groups of science and research communities using advanced R&E cyberinfrastructure. Chip Cox, Vanderbilt and Fisk Co-PI, is the AmLight ExP Project Coordinator and be responsible for day-to-day operations of the infrastructure. As the current Co-PI of AmLight and COO of AMPATH, he has experience in the engineering and provisioning of network connections in Latin America and project management expertise as a previous NSF program director. His responsibilities include coordinating network operations, deployment, and upgrades, ensuring availability of network resources, coordinating technology transfer to providers, and developing new models for AmLight ExP.